Keep kids of all ages occupied in or out of the water with these popular pool toys! Ideal for group play with parachutes and other fun group games. Safe for dodgeball games and indoor classroom activities. Features a multicolored, 6-panel design. 12" is the maximum diameter measured on a deflated ball. Colors may vary. Pack of 12. 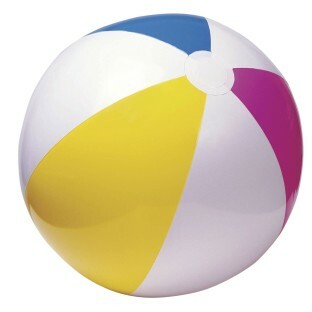 With almost daily use this is a good quality and long lasting beach ball. And the 12 pack make it very easy to have enough on hand all year. Do not like this product. After one day of using one ball for 5 classes the ball deflated. We tried different ball the next day and same thing. Not well constructed. Not a good purchase. The beach balls are great for teaching beginning volleyball...the ball floats so you can bump set spike with students as low as second grade. Very round. Lots of fun!